What little girl wouldn’t love this ‘Unicorn Dreaming’ Premium theme? Pastel pink and canal blue tents with metallic polka dots and gold sparkly unicorns. This is an extremely pretty theme and is finished with beautiful antique gold feature lighting between the tents, hessian and lace bunting featuring more gold unicorns and every tent is adorned with fairy lights. Beautiful pink and aqua metal lanterns may also be supplied with this beautiful theme (replacing the cream lanterns as pictured). 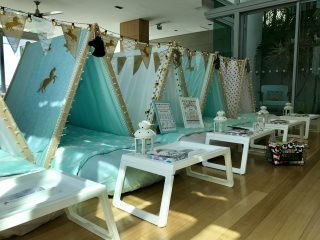 This slumber party set up is perfect for the unicorn or horse crazy girl! This theme is available for set up only by the Dream Team (delivery, set up, styling and pack down) given the delicate nature of the fabrics used.